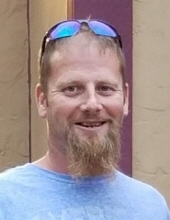 Justin Lee Heinrich, 41, went home to be with his Lord on Thursday, March 7, 2019 in Ponca City, OK. Viewing will be held at Trout Funeral Home in Tonkawa on Wednesday, March 13th and Thursday, March 14th from 9 am to 8 pm with family visitation on Thursday evening from 6-8pm. A celebration of his life will be held at the First Baptist Church of Tonkawa at 2 pm on Friday, March 15, 2019 with Pastor Terry Ballard officiating. Justin will be laid to rest at the Tonkawa I.O.O.F. cemetery following the ceremony. Arrangements are under the direction of Trout Funeral Home & Cremation Service of Tonkawa. Justin was born on August 27, 1977 to Joe and Linda (Hoffman) Heinrich in Enid, OK. He grew up and attended school at the Billings Schools and graduated in 1996. He continued his education at Northern Oklahoma College, graduating in 2001, and continuing on to Oklahoma State University, graduating in 2004. Justin went to work for his father at Joe’s Repair Service in Billings. Justin fell in love with Jacqualyn Atkins and they were married on June 26, 2004 in Stillwater, OK. They resided in Stillwater until they moved to Tonkawa in July 2009. Justin was an avid lover of sports. He enjoyed watching motorsports - NASCAR, NHRA, Supercross, and dirt track racing - and following his favorite racers. He had a love of Oklahoma State and Kansas City Chiefs football and loved cheering on the Tonkawa Buccaneer football team every Friday night. Justin enjoyed summer camping trips in the Rambler with his wife and kids. He loved gardening and fishing with his kids and listening to good music. He loved watching his kids grow, learn, excel in school, and participate in their favorite activities. He loved his family and friends fiercely. He is survived by his wife, Jackie and their two children, Allie and Austin of Tonkawa; parents, Joe and Linda of Billings; one sister, Lonna Stokes of Glencoe; nephew, Jagger Stokes of Billings; father and mother-in-law, Alfred and Chris Atkins of Glencoe; sister-in-law, Julia Atkins of Glencoe; two nieces, Danna Atkins and Rhylynn Garcia of Glencoe; paternal grandmother, Mary Lou Heinrich of Hunter; numerous aunts, uncle, cousins, relatives, and friends. Justin was preceded in death by his maternal grandfather, John Hoffman; maternal grandmother, Velois Hoffman; paternal grandmother, Willa Hisel; and paternal grandfather, Robert Heinrich; and aunt, Beverly Hoffman Payne. To send flowers or a remembrance gift to the family of Justin Heinrich, please visit our Tribute Store. "Email Address" would like to share the life celebration of Justin Heinrich. Click on the "link" to go to share a favorite memory or leave a condolence message for the family.